It’s initiative, Follow The Money, the largest volunteer grassroots movement on transparency and accountability in Africa, emerged winner among three finalists, presented by Bono, the lead singer of the UK group U2, and co-founder of ONE Campaign, during the Mo Ibrahim Foundation Governance forum, that was held on Saturday, April 8, 2017 in Marrakech, Morocco. The Chief Executive of Connected Development, Hamzat Lawal on behalf of the organization, received the award. The Award highlights the dynamism and achievements of African groups and organisations that are building a better future for their communities, countries and continent. “We are super excited to be the recipient of this award and also thankful to ONE Campaign for this great opportunity. This Award restates the continental belief in our rural development works. This we warmly appreciate. 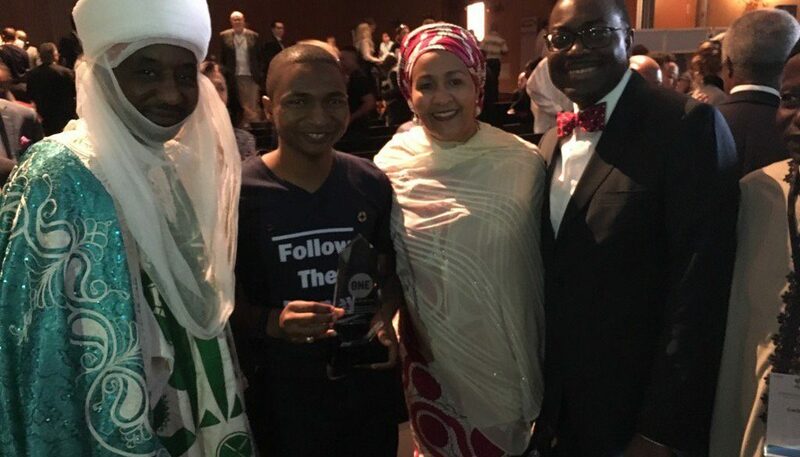 And ultimately, this is timely and will be exceedingly utilitarian in broadening our continental impacts through facilitating development in marginalized communities, as well as empowering them to stand up and hold their leaders accountable.” said Lawal who also doubles as the Co-Founder of Follow The Money. The 2017 Governance Forum which focused on violent extremism and migration, participation and democracy, inclusive economic growth and jobs for youth. brought together various thought leaders in Africa and the World at Large including the Emir of Kano, HRH Sanusi Lamido Sanusi; the United Nations Deputy Secretary-General, Amina J. Mohammed; Former Secretary-General of the United Nations, Kofi Annan; Dangote Group, Aliko Dangote, Former Finance Minister, Okonjo Iweala, Africa Development Bank President, Akinwunmi Adeshina, among other dignitaries. Connected Development [CODE] is a non-government organization [NGO] whose mission is to improve access to information and empower local communities in Africa. Our initiative, Follow The Money advocate, visualize and track government spending and international aid spending in rural communities.